Protect your credit cards and your identity with this slim leather wallet with RFID security. It may be slim but it holds 24 cards plus bills! 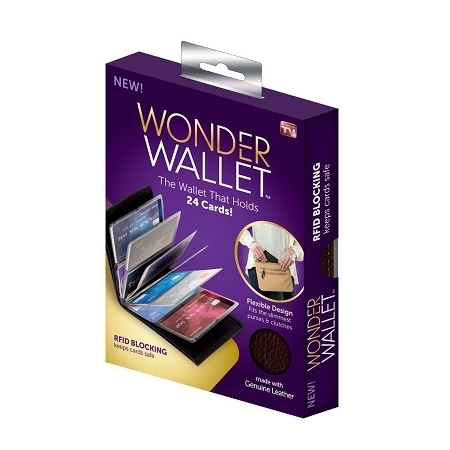 Wonder Wallet, as seen on TV, is the RFID blocking wallet that holds twice as many cards but is twice as thin as traditional wallets. With space for 24 cards plus bills, Wonder Wallet will help keep you organized. The unique design is like a photo album and folds up to a slim size to easily slide into your purse or pocket. This black leather wallet is 5.25" x 4" and is great for both men and women. The RFID security feature on Wonder Wallet protects your identity and personal financial information. Wonder Wallet blocks RFID scanners from being able to access this important information and keeps your identity and credit cards safe. Slim fit leather wallet, RFID blocker protecting your identity, credit cards and other financial information, and enough space for 24 credit cards plus bills- you need to get Wonder Wallet! I purchased three, one for each member of my family. Everyone loved the design. BUT, the insert that actually holds the cards, breaks out after 3 to 6 months depending on wear. That's just not long enough for me to recommend this product.